Endovenous radio-frequency ablation is most commonly used to relieve symptoms of varicose veins. Symptoms include swelling, inflamed veins, discolouration, pain, skin irritation or ulceration. During the procedure, the doctor will apply a topical anaesthetic cream over the area of varicose veins. The site of catheter insertion is numbed by a local anaesthetic agent. Your doctor uses an ultrasound probe to view and track the procedure in the enlarged vein. Under the guidance of ultrasound, a catheter is inserted through a small incision in the skin and is positioned into the abnormal vein. A radiofrequency electrode is then moved through the catheter exposing the tip of the electrode at the site to be treated. After injecting the area of abnormal vein with local anaesthetic, radiofrequency energy is applied at the site to seal the vein. Your doctor will apply pressure to prevent bleeding and the incised opening is covered with a bandage. Following the procedure, you may have to wear compression stockings to avoid formation of blood clots and to reduce bruising and tenderness. You can resume normal activities immediately. Avoid air travel and sitting for long periods during the healing phase. Ultrasound examination may be recommended during follow-ups for monitoring the treated veins and its results. 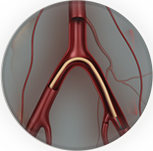 It is difficult to treat twisted veins with endovenous radio-frequency ablation. 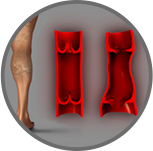 The procedure is useful in treating only large varicose veins. 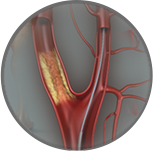 Additional procedures such as phlebectomy or sclerotherapy may be used to treat small branched veins after ablation.